Warren Zevon was an American singer-songwriter known for his "sardonic wit and blazing intelligence" which he incorporated into his music. Some of his well known songs include "Werewolves of London", "Roland the Headless Thompson Gunner", and "Lawyers, Guns and Money". In 2002, Zevon was diagnosed with mesothelioma. He refused any treatment and started on his final album The Wind. The Wind features guest appearances from several of Zevon's close friends (Tom Petty, Bruce Springsteen, Don Henley to name a few). The making of the album was made into a documentary for VH1 entitled, Warren Zevon: Keep Me In Your Heart. When I first heard The Wind, I knew it was Zevon's final album, made while he was dying, and so I listened to it differently than I would other albums. It seems to frequently refer to Zevon's illness (but maybe that's just me). Some songs seemed to contain a lot of regret. Below is "Keep Me in Your Heart" also from The Wind. 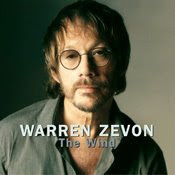 Warren Zevon died September 7, 2003, less than two weeks after the release of The Wind on August 26th. Special thanks to one of my colleagues, Leighton Sweet, for tipping me off about this artist. Thanks so much. Never heard of him before. Looked him up on itunes and absolutely love his work. When things like this happen, it's like getting a present at christmas that is unexpected, but very special. I feel the same way. I had heard a few of his songs before but didn't know who he was until recently when a friend brought him to my attention. Thanks for your comment. Thanks for sharing Warren's story and, especially, this song (Keep Me In Your Heart). As a big fan of his for many years I've been aware of the hard life he had, mostly due to his own choices. He certainly lived his life the way he wanted and also died the way he wanted. His final album, The Wind, is arguably his best but certainly his most touching. I haven't heard a lot of Zevon's other albums but I do agree that The Wind is excellent. What is interesting is how open Zevon was in talking about the choices he made and how that effected his life. Listening to interviews he gave, it seemed that he had some regrets but was able to move through them. Thanks for your comments. This post is featured in this month's Palliative Care Grand Rounds!